Arrow -- "Missing" -- Image AR522b_0145b.jpg -- Pictured (L-R):, Echo Kellum as Curtis Holt/Mr.Terrific, Paul Blackthorne as Quentin Lance, Willa Holland as Thea Queen / Speedy, David Ramsey as John Diggle/Spartan, Stephen Amell as Oliver Queen/The Green Arrow, and Emily Bett Rickards as Felicity Smoak -- Photo: Katie Yu/The CW -- ÃÂ© 2017 The CW Network, LLC. All Rights Reserved. Team Arrow is on a high after their big win in getting Chase behind bars. 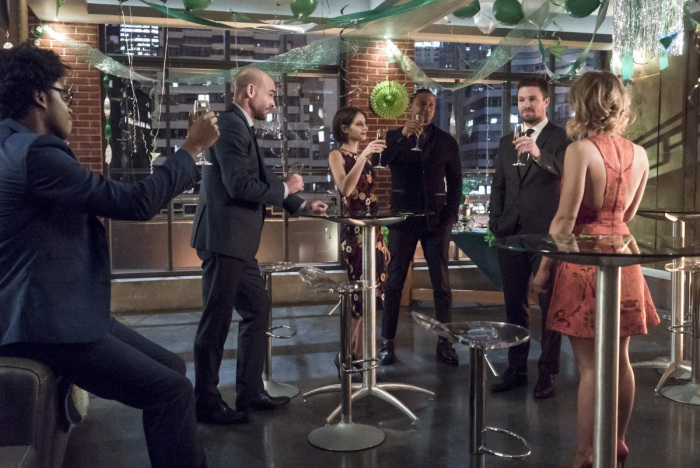 The team decides to throw Oliver a surprise birthday party that results in Curtis getting flipped over. Also, I love the total shout out to artist Lord Mesa whose handiwork was on Oliver’s cake and Felicity saying the cake came from Lord Mesa Bakery. Total love Mesa’s artwork and when I was at San Diego Comic Con back in 2015 I bought four of his prints of Supergirl, White Canary, the Flash/Green Arrow/Firestorm and one of the Green Arrow as Darth Vader. I digress, during the birthday celebration Team Arrow is totally reading the sexual tension between Felicity and Oliver. Oliver can’t seem to relax but Felicity encourages him to celebrate their win. Later Curtis drops by Dinah’s to drop off a modulator that helps her Canary Cry break through any dampeners. However, when Curtis arrives, Dinah’s place is a mess and nowhere to be found. Soon Curtis is knocked out. Luckily Curtis was on the phone with Felicity when it happened. When Diggle and Oliver arrive to investigate they see that it was Talia Al’ Ghul and her cronies that took Dinah and Curtis. Original Team Arrow realize that Chase has planned this and it was his intention to get captured. So Oliver sends Thea and Quentin to safety and all realize that Rene didn’t skip out on his daughter’s hearing but was taken too. More bad news comes when Felicity informs Oliver and Diggle that Black Siren is missing. Arrow — “Missing” — Image AR522a_0152b.jpg — Pictured (L-R): Katie Cassidy as Laurel Lance/Black Canary and Paul Blackthorne as Quentin Lance — Photo: Katie Yu/The CW — ÃÂ© 2017 The CW Network, LLC. All Rights Reserved. Oliver tries to reach Quentin and Thea at their safe house to warn them but it is too late. Quentin comes face to face with “Laurel” and hesitates to take action. Thea tries to tell Quentin about this Laurel but they both get tranq by Evelyn. In a container unit, Thea explains to Lance about multiple Earth’s and this Laurel is from Earth-2 and is not the Laurel they know and love. Black Siren arrives and is concerned for Quentin but he doesn’t quite believe her. Quentin and Thea are then moved to another container unit for destination unknown. Oliver visits Chase and asks where he has taken his team but Chase refuses to say anything but that he will kill them unless Oliver lets him go. Oliver then decides to send Felicity and Diggle away as Chase would assume that he would keep them closer. Unfortunately, Oliver was wrong and Felicity and Diggle are taken by Talia’s goons. Alone in the Arrow Cave, Oliver looks at the mannequins for everyone suits when he is set upon by Malcolm. Malcolm is there to help Oliver find Thea and is willing to do what it takes to find her. Oliver and Merlyn reluctantly work together and discover Felicity and Diggle have been taken. Arrow — “Missing” — Image AR522b_0294b.jpg — Pictured: John Barrowman as Malcolm Merlyn — Photo: Katie Yu/The CW — ÃÂ© 2017 The CW Network, LLC. All Rights Reserved. Oliver is alerted to Chase’s prison transfer and goes to witness it. Chase once again asks Oliver to let him go because once he is on the transport helicopter he has ordered his friends to kill Team Arrow. Oliver refuses but once he gets a phone call from William begging for someone to help him is when he springs into action. With Malcolm’s help, Oliver gets rid of Chase’s guards and lets him go. After some time, Oliver figures out where Chase has went and enlists some help. The first is Nyssa Al Ghul, someone Malcolm isn’t thrilled having to team up with. Before we get to the episode’s end, the Russian Flashback was all about Kovar torturing Oliver by first injecting him with a serum that helps him relive the pain that was inflicted on him on the island. Kovar then mentally tortures him by making him relive all the things he had to endure during his time on the island and Hong Kong. Kovar gives him a gun with one bullet and wants Oliver to use it on himself. Oliver then sees a vision of Yao Fei who blames Oliver for his daugther’s death. It looks like Oliver is about to kill himself but then sees Laurel who encourages him to live. Oliver uses the one bullet to shoot his jail cell door and escapes.